Altar Oil – To cleanse and consecrate the altar. Anointing Oil – To anoint and bless the participants. Should be charged at full moon ceremony. Banishing Oil – To dispel and remove negative energies, dark energies and/or energies from a lower vibration. Bewitched Oil – To enhances spell worked on a person, place or thing. Black Cat Oil – To invoke the aid of a spirit helper or familiar. 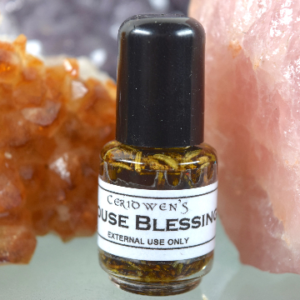 Blessing Oil – To conjure beneficial energy on the recipient. Ceremony Blessing Oil – Invokes beneficial energy for a ritual ceremony. Circle Oil – Sets and secures the circle of energy in the ritual. Commanding Oil – To strengthen the command over energies and entities summoned in the ritual circle. Cone Of Power Oil – To strengthen, focus and enhance the ritually raised vortex of joined power. Conjuration Oil – To summon and bring about a magickal result; to stengthen and enhance energy as preparation for spell working. Coven Oil – To bind and focus the energies of a group of individuals who come to contribute their powers to the magickal purpose of the ritual. Evocation Oil – To raise a specific quality of energy. Flying Oil – To assist in astral projection and travel. Grounding Oil – To ground and balance energy in a ritual or in the participants. High Priest Oil – To heighten the ability of the central individuals to gather and join the power of the participants for a magical purpose. To balance the energy of one of those individuals should the other not be present. Holy Oil – To consecrate and bless ritual objects and space. House Blessing Oil – To seal and bless a house or room after it has been ritually cleansed. Initiation Oil – To empower the journey of the initiate to gain strength, wisdom and power. Invocation Oil – To call for a spirit, entity or energy. Le Sorciere Oil – Ancient formula to enhance and magnify the powers of the spell worker. Magician’s Oil – To draw forth and focus an individual power to do spellwork. Midnight Magic Oil – Tap the energy of the most powerful magic hour. Pre-Ritual Oil – To cleanse, prepare, and “make ready” participants prior to any ritual. Can be used with bath crystals. Purification Oil – To remove negativity and inharmonious vibrations. Can be used with bath crystals. Uncrossing Oil – To remove and negative spellwork set to bind an individual. Can be used with bath crystals. Wiccaning Oil – To formalize and celebrate the naming and dedicating of a baby.